Promising work is underway in the laboratory of Dr. Stephen Hursting at the NRI to identify dietary interventions that can reduce the risk of cancer. 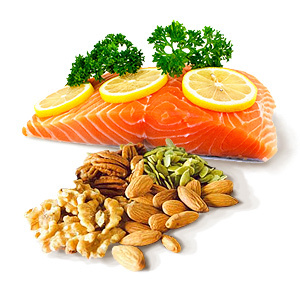 Omega-3 fatty acids are well known anti-inflammatory dietary supplements. Because inflammation is associated with cancer, Hursting is investigating whether these supplements can reduce risk of developing cancer. In a recently published report (Ford et al., 2015), Hursting and colleagues asked whether omega-3-fatty acids inhibit tumor growth in a mouse model of breast cancer. This particular study looked at tumors representative of human post-menopausal triple-negative breast cancer (TNBC). TNBC in humans is highly aggressive and associated with higher recurrence and mortality. Notably, the study found that two omega-3 derivatives, EPA and DHA (anti-inflammatories commonly found in fish oil supplements), reduce TNBC tumor growth in obese, but not non-obese, mice. Obesity is a source of systemic inflammation. The finding of differences between obese and non-obese mice suggests it is the anti-inflammatory properties of EPA and DHA that limit tumor growth. Studies such as this in a mouse model lay the foundation for translational research. In collaboration with Carol Fabian at the University of Kansas Medical Center, Hursting is conducting clinical trials of EPA and DHA in humans. So far, these studies have tested whether: (1) EPA+DHA supplementation at elevated dosages was practical and (2) whether specific biomarkers could be measured and were affected by supplementation in premenopausal (Fabian et al., 2015a) and postmenopausal (Fabian et al., 2015b) women. It is important to note that none of these women had been diagnosed with breast cancer, but all were at elevated risk based on familial history or other factors. The results, while preliminary, are encouraging. Ki-67, a protein involved in cell proliferation, decreased in both pre- and post-menopausal women after 6 months of dietary supplementation. In contrast, the levels of most measured hormones did not change, indicating that the EPA+DHA supplement acted selectively, important for the minimization of side effects. Several other measures of cancer risk were improved in postmenopausal, but not premenopausal women, as well. Together, these papers suggest that further investigation of EPA+DHA, using placebo-controlled clinical studies, is warranted, especially for post-menopausal women with TNBC. They also suggest that the proteins Ki-67 and adiponectin and the hormone estradiol are candidate endpoints for these studies. Ford NA, Rossi EL, Barnett K, Yang P, Bowers LW, Hidaka BH, Kimler BF, Carlson SE, Shureiqi I, deGraffenried LA, Fabian CJ, Hursting SD (2015). Omega-3-Acid Ethyl Esters Block the Protumorigenic Effects of Obesity in Mouse Models of Postmenopausal Basal-like and Claudin-Low Breast Cancer. Cancer Prev Res (Phila). 8:796-806. Fabian CJ, Kimler BF, Phillips TA, Box JA, Kreutzjans AL, Carlson SE, Hidaka BH, Metheny T, Zalles CM, Mills GB, Powers KR, Sullivan DK, Petroff BK, Hensing WL, Fridley BL, Hursting SD (2015a). Modulation of Breast Cancer Risk Biomarkers by High-Dose Omega-3 Fatty Acids: Phase II Pilot Study in Premenopausal Women. Cancer Prev Res (Phila). 8:912-21. Fabian CJ, Kimler BF, Phillips TA, Nydegger JL, Kreutzjans AL, Carlson SE, Hidaka BH, Metheny T, Zalles CM, Mills GB, Powers KR, Sullivan DK, Petroff BK, Hensing WL, Fridley BL, Hursting SD (2015b). Modulation of Breast Cancer Risk Biomarkers by High-Dose Omega-3 Fatty Acids: Phase II Pilot Study in Postmenopausal Women. Cancer Prev Res (Phila). 8:922-31.